"Don't you say a word!" Hmmmnm - your spot was taken!! "We have here a very rare sighting of the five clawed sloth"
BWA-HA-HAA! YESS!! *ducks* ALLIE! MOMMY! ALLIE'S HITTING ME AGAIN! 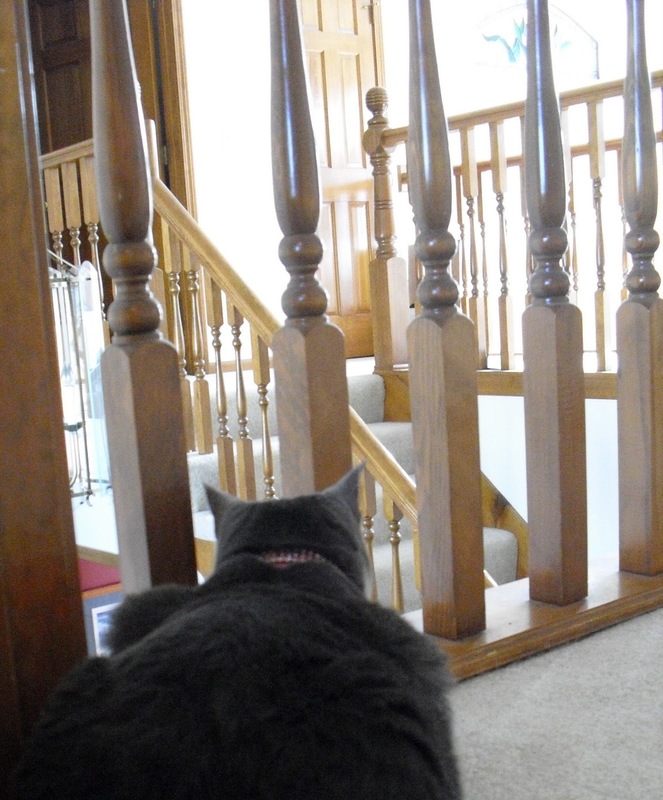 The Human luffs that first picture with all the stairs and banisters. It looks like an MC Escher picture, whoever that was. Sigh. Humans! Like the CAT is not the most important thing in the picture! FaRADaY: TOTALLY! Especially if the cat is YOU and not your SISTER. Is Allie in your spot?? FaRADaY: YESSS! An' I has a MAD about it! Allie: *giggle! * Ooooh THANK you! *wiggles pink toenails* Nice to meet you! 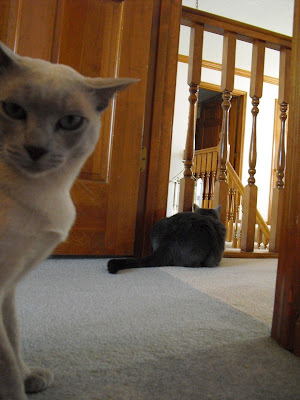 thanks for linking up for Weekend Cat Blogging! Pam, we were soo excited to find you - fanks for letting us pawticipate! Cool shots, kitties! Hope you have an Easy Sunday! FaRADaY: an AWARD? Mowzers, that's PAWESOME! Maxwell: Thank you so much! We're honored!! Hahaha! The expression on your face is priceless! Hi Kitties, thanks for visiting our blog the other day :-) You guys sure have some snazzy looking railings, Ben would love to tightrope walk those banisters...it always gives mum heart failure (hee, hee)!!! Maxwell: ooooh no you're not! momma would skin you alive! We like the garage and the warm smells from the car. But we mostly like that we can get into the roof of the garage from the top of that car. There is a big hollow space up there. Faraday, your facial expression just about says it all, pal. (It says, "Get out of my spot, Allie.") MOL!